Integrated Engineering Software programs are industry leader for fulfilling the software needs in Insulator design. Our proprietary Boundary Element Method (BEM) solver technology provides the most accurate numerical field solutions for these types of problems, and it’s the method of choice for problems that involve the modeling of space around the device in “large open regions”. The Finite Element Method (FEM) solver is incorporated in the programs as well to provide choice of both methods. Industrial giants like Hubbel Power Systems, MacLean Power Systems, Lapp Insulators, Quebec Hydro, Manitoba Hydro, BC Hydro, Bhel India and K-Line Insulators Limited are using our software programs for modelling and optimizing their insulator designs. 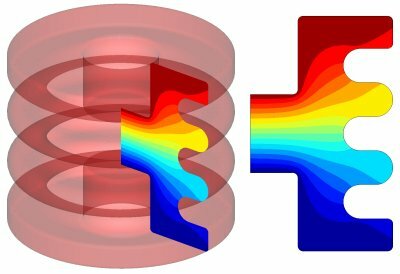 In rotationally symmetric insulators, electric field analysis should be done with ELECTRO, and for thermal analysis, KELVIN should be used. If there is a significant non-rotational (3D) aspect to the physics (e.g. non-rotational insulator shape, parallel wire connections, water droplets); then for electric analysis, COULOMB should be used, and for thermal analysis, CELSIUS should be used.